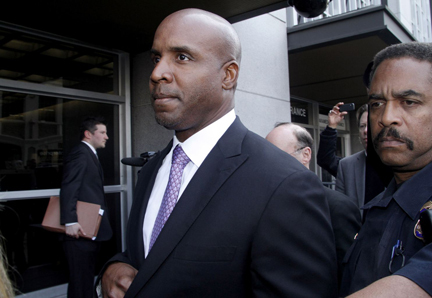 A lawyer for Barry Bonds urged a federal appeals court on Wednesday to toss out the slugger’s obstruction of justice conviction, saying a rambling answer he gave while testifying before a grand jury was not a crime. Appellate specialist Dennis Riordan argued that Bonds was not formally or specifically charged with the felony that he was convicted of committing. A federal jury in April 2011 found baseball’s all-time home runs leader guilty of obstruction for saying he was a “celebrity child” when asked about injecting steroids. That particular exchange wasn’t included in the indictment originally released in November 2007. The omission is “the dagger in the heart of this conviction,” Riordan argued. Further, Riordan said that Bonds ultimately answered the question when put to him again and denied receiving any substance to inject. Judge Michael Daly Hawkins wondered aloud if Bonds’ direct denial undercut the government's argument that Bonds intentionally misled the grand jury. Assistant U.S. Attorney Merry Jean Chan countered that the denial was a lie because Bonds’ former personal assistant, Cathy Hoskins, testified that she witnessed Anderson inject Bonds. Chan said Bonds’ denial and his other rambling answers to the same question throughout his grand jury appearance added up to obstruction. “He answered the question falsely each time,” she said. Bonds and his legal team are asking a three-judge panel of the U.S. 9th Circuit Court of Appeals to dismiss the lone felony conviction stemming from Bonds’ 2½ hours of testimony in December 2003 before a grand jury investigating performance enhancing drug use and sales among elite athletes. Bonds, who was rejected by voters last month in his first year of eligibility for the Hall of Fame, wasn’t required to attend Wednesday’s highly technical hearing, though Riordan said his client expressed a desired to watch the proceedings in person. Riordan said outside court that he advised Bonds to watch from afar rather than personally attending the 35-minute session San Francisco. A local television station was given permission to show the hearing live and streamed at least a couple of segments on the Internet. “His presence would have been a distraction,” Riordan said. Legal experts who have followed the case closely since his grand jury appearance in December 2003 are divided over Bonds’ chances before Daly Hawkins and Judges Mary Schroeder and Mary Murguia, each of whom was appointed by a different Democrat president and all of whom are based in Phoenix, home of San Francisco’s division rival Diamond­backs and about a 20-minute drive from the Giants’ Scottsdale spring training facility. One set of analysts argue that appellate courts are reluctant to overturn jury verdicts absent an overwhelmingly obvious mistake. They say that U.S. District Judge Susan Illston, who ran the trial, is a respected jurist who has few of her cases overturned. On the other hand, there are those lawyers who argue that Bonds stands a good chance to clear his name. If Bonds’ conviction is upheld, he will have to serve 30 days house arrest.